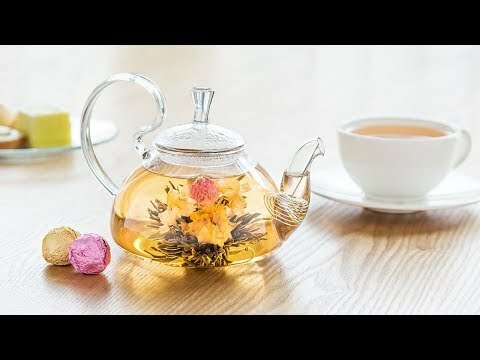 Tea time can be a mesmerizing ritual with these blooming tea flowers. Each flower opens and grows as it steeps, releasing fragrance and flavor into your brew. 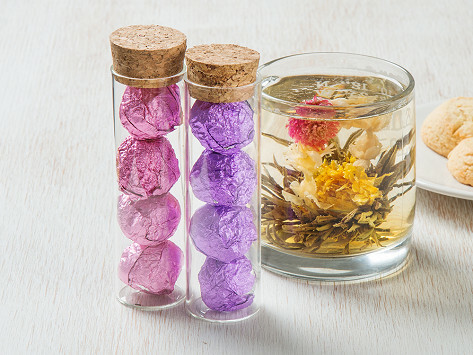 These two sets of four beautifully-wrapped blooming teas come in a collectible glass tube with a wooden cork. Each flower is good for about three infusions. Serve in a glass tea pot to really enjoy the aesthetics. This was nifty and cute. My wife and granddaughter enjoyed sharing some tea time together. The flowers opened exactly as seen in the promo and the tea has a wonderful delicate taste and quite delicious. Got such compiments, gave away as gift! Great fun to see what develops with the pods. Want to order the other two flavors to see is the flowers are even prettier.